Near Lucerne and easily accessible by public transport, the Pilatus (2,132m a.s.l.) is the ideal adventure mountain for the whole family. The world’s steepest cog railway starts its climb at Alpnachstad and tackles a maximum gradient of 48 percent, thereby passing forests, meadows and rock faces. On the north side, a gondola cableway and an aerial cableway connect Kriens to Pilatus Kulm. With the new aerial cableway Dragon Ride, guests are practically flying up to Pilatus. 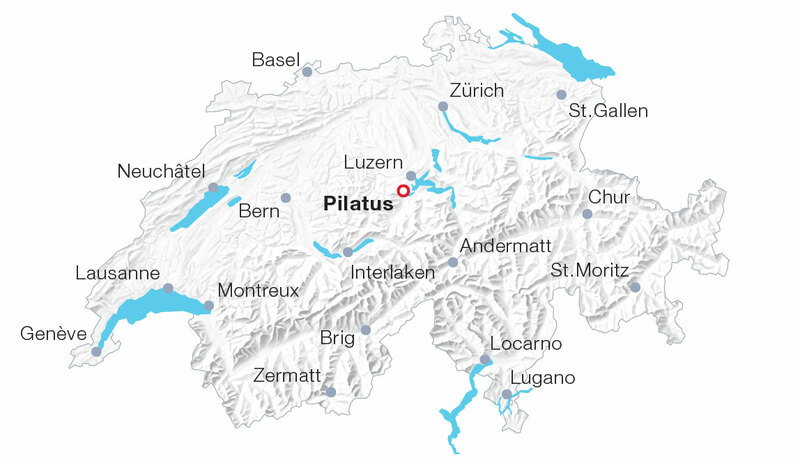 It takes the cableway a mere 3.5 minutes to reach Pilatus (2,132 m a.s.l.) from the intermediate station Fräkmüntegg (1,416 m a.s.l.). Thanks to spacious seating, a cockpit-like structure and large windows, the cableway offers a unique view of Lucerne and its lake.